Richard B. Russell Library for Political Research and Studies: Truitt Family Papers Now Open! Truitt Family Papers Now Open! The Richard B. Russell Library for Political Research and Studies is pleased to announce that the Truitt/Billings Family Papers are now open for research. S.D. 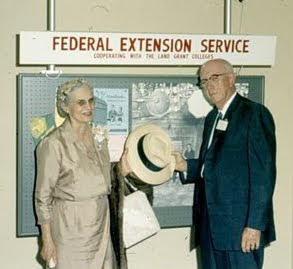 Truitt served as a county extension agent in Georgia from 1917 to 1966. This collection focuses primarily on Truitt’s career, his involvement in civic life, and his family’s involvement with the Fulton County 4-H camp. The collection also contains materials documenting the career of Truitt’s son-in-law, Ray Henry Billings, a communications engineer who played a role in designing a new 911 system for the Atlanta Police Department in 1974. The Truitt/Billings Family Papers provide a rich portrait of family life in Georgia in the mid-twentieth century. This collection contains clippings, photographs and awards received by S. D. Truitt over the course of his career. Truitt was so committed to his profession as an extension agent that when the opportunity arose in 1930 to move up to the position of county manager of Hancock County, he chose to forgo the promotion and sizable pay raise in order to stay close to his agricultural roots. His commitment and hard work were rewarded with the American Hereford Association’s Award for Outstanding Leadership and Achievement for Rural Youth in 1958 and the U. S. Department of Agriculture’s Superior Service Award in 1959. The Russell Library is open for research from 8:30 am – 4:30 pm, Monday through Friday, with the exception of University holidays. For further information on the Truitt/Billings Family Papers contact russlib@uga.edu or call (706) 542-5788.